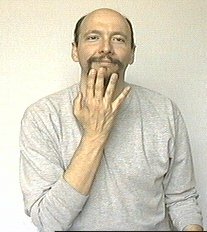 To do the sign for "color" hold your hand up in front of your neck and chin area then flutter the fingertips. YOUR FAVORITE COLOR, WHAT? = "What is your favorite color?" When you sign color with furrowed eyebrows, it is generally interpreted as "what color?" I'm having trouble with the sign for "color". Do you simply hold the hand in front of your mouth and flutter the fingers? Thank you! You don't have to make contact with the chin. It is very common to just hold the hand in front of your neck and flutter the fingers in front of (but not touching) the chin. However, it is "okay" to do the flutter "on" the chin. Both methods are well accepted.